At Organica, we are working to solve the biggest problem of our time – a sustainable future for generations to come. Our solutions are effective, sustainable and responsible. We have solutions for agriculture, solid waste management, wastewater treatment, sanitation, aquaculture, animal health, and home and office. Our solutions work. Everywhere. Farms, industrial plants, livestock, fruit, sanitation issues, waste management… we have a solution for everything. The harsh reality of present day cleaners! The average person is exposed to 62 chemicals every day! And you don’t even have to be employed in a chemical factory! This exposure is from chemicals found in the detergents, floor cleaners and odour eliminators – all found in the safe environs of your own home. Prolonged exposure is detrimental to human health leading to several ailments. When you flush them down the drain, they also find their way into the environment, threatening animal and plant life. Our OB Care range of cleaning supplies is revolutionising cleaning processes, the eco-friendly way! 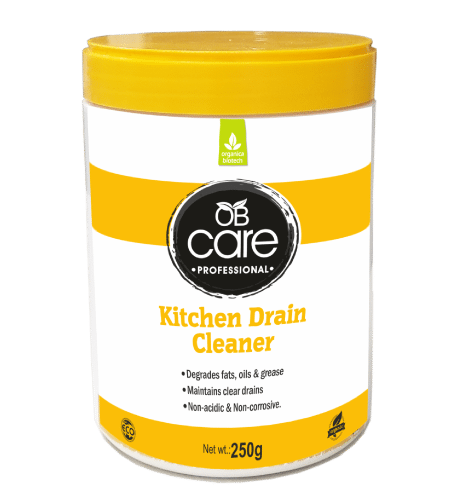 Please use the button below to request more information about our OB Care range of cleaning supplies and find out how you can keep your offices and homes clean while healing the environment. I'd like more information about Organica Biotech's OB Care range of cleaning solutions. 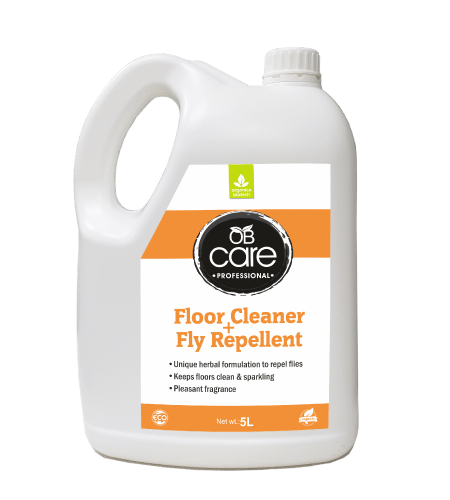 Specialised formula which not only leaves your floor sparkling clean but also aids in repelling flies. Can be used for all kinds of flooring, table tops, kitchen taps, etc. 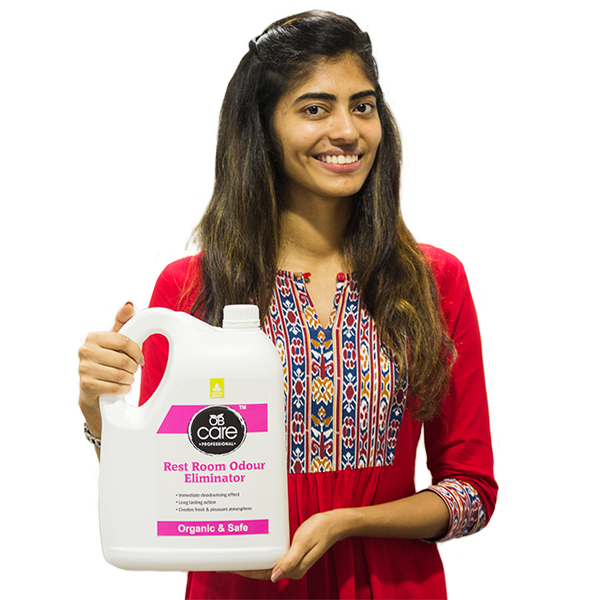 An organic formulation that can be used for cleaning floors and surfaces on a daily basis; it is a single stop solution for maintenance of surfaces. Can be used for general areas, passages, corridors, cabins, kitchens, washrooms, etc. This water-based organic formulation is ideal for all types of glass and helps to remove oil, grease, fingerprint stains and organic residue instantly. This product can be used for all types of glass, mirrors, windows, glass doors, vinyls, sunmica, T.V. & computer screens, refrigerators, etc. Available in ready to use form. A bio-based organic cleaner with nano-buster technology. This eco-friendly blend effectively cleans toilets and removes stains, giving your ceramics a fresh and sparkling look. Can be used in all Indian and western toilet bowls and urinals. This special enzyme based formulation helps to eliminate rest-room odor. Just spray the liquid on all surfaces to eliminate foul restroom odor and give it a pleasant fragrance. Can be used on walls of the restroom, areas adjoining water closets and in inaccessible corners. A potent organic formulation with beneficial enzymes that loosen up stains and remove them effectively. Prolonged usage prevents further build up. Highly effective on various kinds of surfaces. Can be used on varied surfaces including surfaces made of tiles, marble, granite, ceramic and glass. An excellent way to keep drains clogged free and maintain drain lines. This enzymatic product is extremely effective on fats, oils, grease and other organic deposits in kitchen drains. Its non corrosive formula prevents corrosion of drain lines. Can be used in kitchen drains and kitchen grease traps. An advanced, biobased, organic formulation to degrade stubborn deposits of fats, oils and grease. It can be used for deep cleaning of greasy/oily surfaces without a trace of any sticky residue. Can be used for cleaning greasy, oily and grimy surfaces, stubborn and dried food on kitchen platforms, chimneys, etc. Toilet flushing results in a loss of 30,000 litres of water year – from each toilet. Over 95% of human waste is liquid. Water used for flushing urine significantly increases the net sewage volume. Using hard water for flushing is not an option as it may form scales leading to blocked drain lines. Our revolutionary FlushFree urinal care programme can solve all these problems. This technology comprises of two components, “Flushfree Urinal Spray”and “Urinal Drain Cleaner”. An amalgamation of both these components can revolutionize the toilet cleaning process. Using FlushFree waterless urinals leads to a marked reduction in consumption of fresh water for flushing and also in the corresponding volume of sewage. And conventional toilets can be converted to waterless urinals without any major structural modifications. Please use the button below to request more information about FlushFree and find out how you can save at least 30000 litres of water every year at your offices. I'd like more information about Organica Biotech's Flush Free waterless urinal solution.